It won't be long until Valentine's Day. It's almost here! ﻿For many years now, Valentine's Day has held an extra special meaning for me as it was the day our son was born! Such a perfect expression of love. I've always looked forward to planning something special for him and our family. Here's a favorite photo from the past - I just couldn't resist that red velvet outfit! (but I will resist showing you the heart cake). I still look forward to creating something special just to celebrate Valentine's Day! I get busy in the workshop and have fun with all the shades of pink and red (with some herbal green thrown in too), lots of ribbons, bows and specialty papers. This year I tried to make it all about something sweet and romantic. 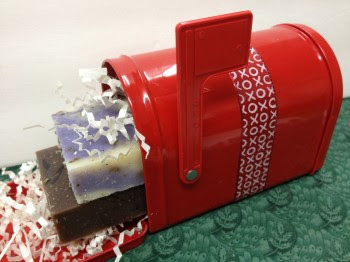 Our Valentine soaps ~ now available for a limited time! With peppermint essential oil and dried mint leaves, Peppermint Kisses is an invigorating experience for your skin and your senses. 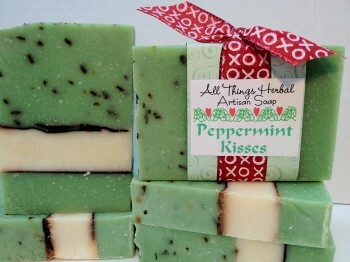 Treat a loved one to a Minty Kiss with this soap. It's even wrapped with a XXOO ribbon! 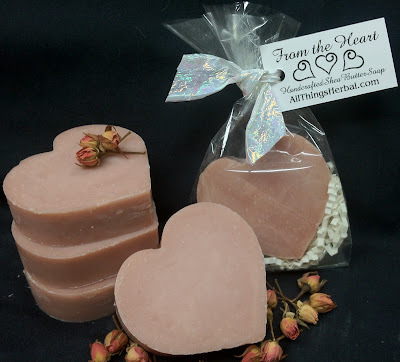 ﻿﻿﻿From The Heart Soaps ~ These "pretty in pink" clay beauties have sweet notes of citrus, neroli, orchid, jasmine blended together with earthy amber and musk. A wonderful Valentine scent, perfect for the tea or latte lover. 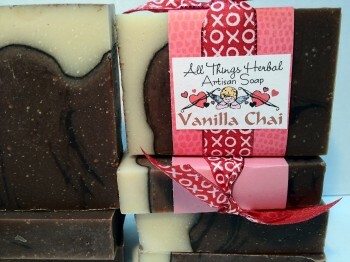 Vanilla Chai Herbal Soap is swirled it with cinnamon and spices, and the warm brown color comes from the vanilla. The extra cocoa butter in this bar is very moisturizing. Something new this year - hearts inside of hearts. First, I made a small pink heart. Then, I made a second batch of soap and nestled the first heart inside of larger heart. A stunning blend of mimosa, florals, amber and vanilla. Absolutely precious smelling! I love this photo. I took it outside a few weeks ago after a snowfall. Those are fresh snowflakes in front of the Sweet Chocolate Bar! 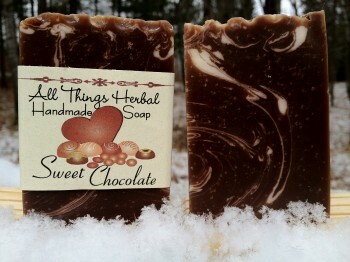 If you love chocolate, you'll love this handmade soap. It's scrumptiously made with the irresistible richness of cocoa butter and chocolate. All of the wow with none of the guilt! 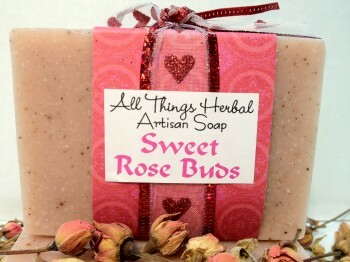 Sweet Rose Buds features pink kaolin clay, flecks of rose hips and a comforting essential oil blend reminiscent of a rose garden. 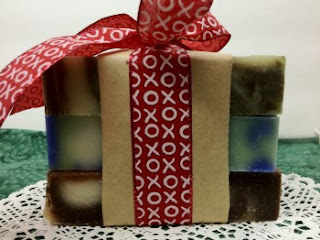 This Valentine soap comes wrapped in a beautiful iridescent heart ribbon, all ready for gift giving. Those are a few of my favorite handmade Valentine's Day gift ideas. For more ideas, check out our Valentine's Day Gifts page on our website. Since Valentine’s Day represents love, why not pamper your lover, best friend, son, daughter or favorite aunt with some pure herbal decadence? The gift of handmade will be well enjoyed by the one you hold dear!